​Check out our upcoming event! We are partnering with an Ohio State student group in honor of International Women's Day to highlight New American artists. The DISPLAYced Exhibition & Celebration will be on March 27, 2019 at TRISM. You can see the official flyer here. ​On Friday, November 16, 2018, our Director Mark Poeppelman will speak at the UPLIFT ARMENIA event, organized in support of Armenia Children's Support Fund. ​We will be happy to meet you there! 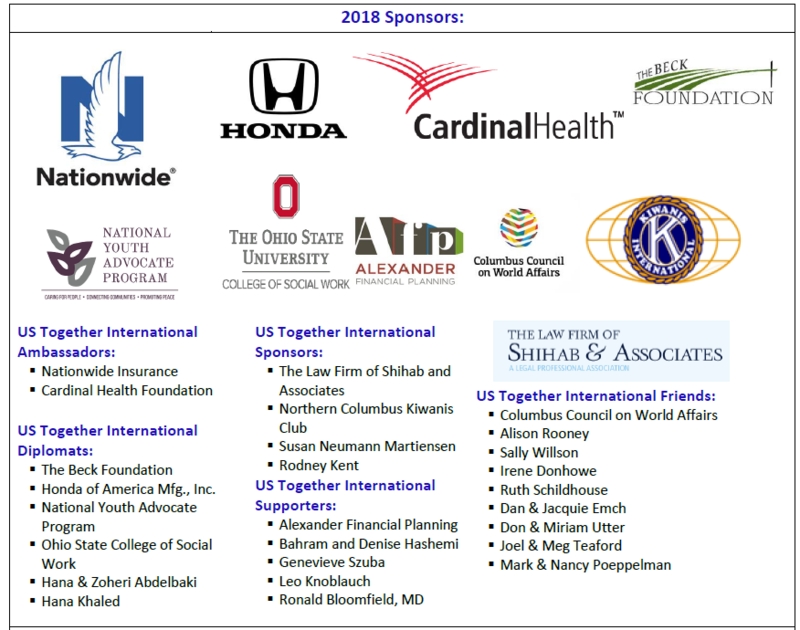 ​US Together, Inc. in partnership with OSU Wexner Medical Center invites you to the 2018 Refugee Integration Conference: Overcoming Trauma to Integration. CE Credits are available for nurses and social workers. For more information, please click here. In early June 2017, our director, Mark Poeppelman, attended the U.S. Global Leadership Coalition (USGLC) Summit in Washington, D.C! At the summit, NGO and business leaders from all over the country spoke about the importance of strengthening the United State's moral leadership and diplomatic relations. A few key speakers included Senator Tim Kaine, Secretary of Treasury Jacob Lew, Congressman Don Bacon, Congressman Tom Emmer, and Congresswoman Pramila Jayapal! Within the course of two days, topics such as national security, economic engagement, and third-world development were discussed in great detail. ​In addition, on the last day of the Summit, Mark had the opportunity to visit capital hill. Along with 500 other participants, Mark advocated to maintain the current federal spending level on international affairs-only 1% of the entire federal budget- in an attempt to curb proposed cuts to the International Affairs Budget. As an organization that promotes global understanding, CIP encourages you to follow Mark's example! Contacting local congress men and women is a great way to voice your concerns over the future of our international affairs policy. We thank our generous sponsors! ﻿Click here for Sponsorship Opportunities﻿.